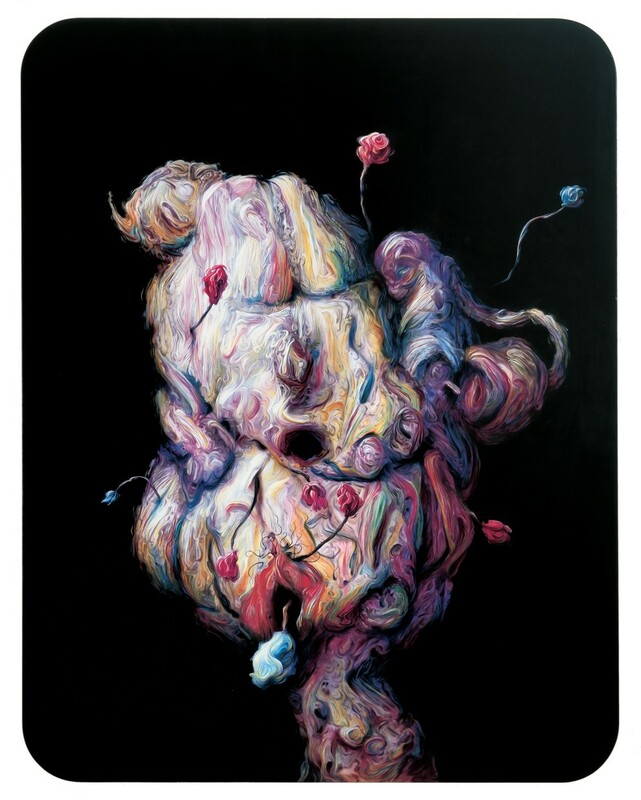 One of Brown's most lurid and disquieting "blob" paintings references a figurative piece by German neo-expressionist Georg Baselitz (b.1938) as well as the style of celebrated showman and surrealist Salvador Dali (1904-1989). Baselitz began to turn many of his compositions upside down in 1968 to redirect the focus from the figure to the formal qualities of the painting. The piece Brown references was executed before this in 1965 but he anticipates Baselitz's upending disorientation while simultaneously adding and subtracting the suggestion of body parts and orifices. The figure's legs are removed, its belly button gives way to a black void in the center of the composition, and a blue flower takes the place originally occupied by the figure's head. As a monkey-like creature starts to emerge on the right and Brown conjures allusions to mouth and vaginal-like openings across the rest of the amorphous blob (with Dali-esque mustaches attached), he also channels the famously grotesque work of 15th and 16th century German and Dutch painters like Hieronymus Bosch (1450-1516). Such work is abject and alluring at once, reflecting Brown's view of beauty as a sliding spectrum between ugliness and attraction.